Eagles left tackle Halapoulivaati Vaitai (72) getting ready to block Cowboys defensive end DeMarcus Lawrence during a New Year’s Eve game. 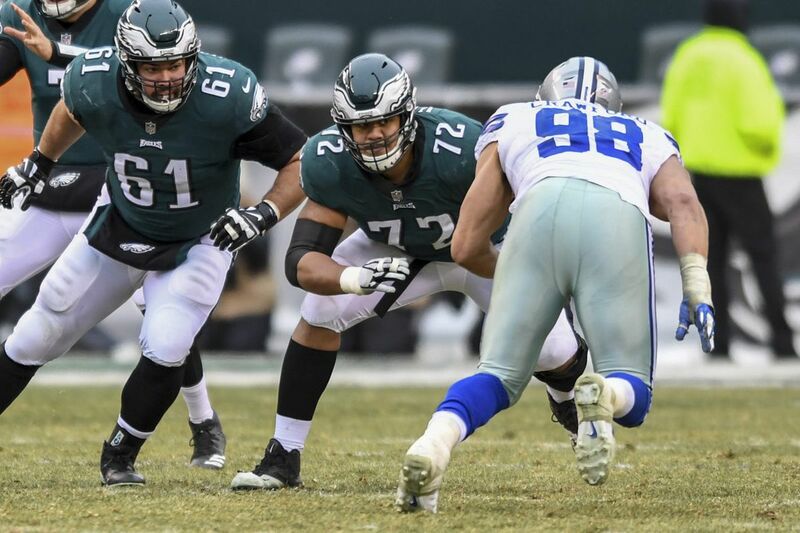 When nine-time Pro Bowl left tackle Jason Peters tore an ACL in Week 7, Eagles head coach Doug Pederson and offensive line coach Jeff Stoutland had a big decision to make. Should they move right tackle Lane Johnson over to Peters' spot and insert second-year player Halapoulivaati Vaitai at right tackle? Or should they have Johnson stay put and insert Vaitai at Peters' left-tackle spot? Another reason, not mentioned by Stoutland, factored into the decision. Stoutland surveyed the Eagles' nine remaining regular-season opponents and realized that most of the defenses the Eagles would be facing stationed their best pass rusher on the left side of the defense, across from the right tackle. It was Johnson who ended up dealing with the Broncos' Von Miller and the Raiders' Khalil Mack and the Cowboys' DeMarcus Lawrence and the Seahawks' Michael Bennett, and even the Falcons' Vic Beasley last week in the Eagles' divisional-round playoff win. Vaitai hardly got a free pass. He has gone against some pretty good pass rushers as well, including the Giants' Olivier Vernon and the Rams' Robert Quinn, but nowhere close to the murderers'-row group that Johnson faced. And muzzled. That will change Sunday night at the Linc when Vaitai faces the biggest edge-rushing challenge of his young career. He'll spend most of the game tangling with the Vikings' 6-3, 280-pound' three-time Pro Bowl defensive end, Everson Griffen. How well he handles Griffen could go a long way toward determining whether the Eagles reach the Super Bowl for the first time in 13 years. Griffen is a load — a big, strong, fast, often unstoppable load. He had 13 sacks this season and has 43½ over the last four years. He also is an excellent run stopper on a defense that finished second to the Eagles against the run. Pederson understands the impact Griffen could have on this game if the Eagles can't contain him. The coach referred to him as a "game-wrecker'' earlier this week. Pederson doesn't say that about many guys. Pederson means he has no intention of leaving Vaitai out there on an island with Griffen all night and hoping for the best. The Eagles have come too far to be that reckless now. At the same time, he can't babysit Vaitai with a tight end all night, either. The Eagles need to get Zach Ertz more involved in the offense than he was last week when he caught just three passes for 32 yards against the Falcons. "We'll have some chip-pros [chipping him with a running back], some slams by the tight end,'' Johnson said. "But other than that, I think he'll be all right over there. [Griffen's] just another guy, man. Even with Johnson dealing with many of the tougher pass rushers on the Eagles schedule, Vaitai still had had his ups and downs this season. He played 455 pass-block snaps and gave up nine sacks, 10 quarterback hits and 20 pressures, according to Pro Football Focus. The nine sacks, confirmed by a review of the all-22 video, were the second-most allowed by an offensive tackle this season. The Browns' Spencer Drango, another backup who replaced a perennial Pro Bowl left tackle (Joe Thomas), gave up 10 sacks in 10 starts. Eagles offensive tackle Halapoulivaati Vaitai holds the football during practice at Angles Stadium of Anaheim in Anaheim, California on Friday, December 8, 2017. Five of the nine sacks Vaitai allowed came in the Eagles' final five regular-season games: two against the Seahawks, two against the Rams and one against Vernon and the Giants. Vaitai did not make himself available to reporters this week during the media's daily 45-minute locker-room availability, despite requests to the team's public relations staffers that they bring him out. NFL rules require that every player be made available to the media at least once during the week. Vaitai has been dealing with some knee tendinitis. He hasn't been on the Eagles' injury report this week but was on it late in the season. Peters, who is at the NovaCare Complex every day and on the sideline during games, has spent a lot of time mentoring Vaitai on the practice field, in the locker room, and in the film room. He also talks to him during games. He no doubt has given him some insight into blocking Griffen, whom Peters has faced three times in his career, including last season in a 21-10 Eagles win. Griffen "is a fast, strong guy,'' right guard Brandon Brooks said. "He's played in this league for years now and has a lot of experience.